Product Description: Safe for the chemically sensitive; non-allergenic. 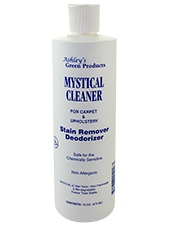 Mystical has been especially formulated for today's stain protected carpets or fabrics, as well as the older ones. Will not hurt any colorfast fabrics. Leaves no film or residue to attract dirt. Mystical cleans these stains and many more: pet stains, blood, coffee, tea, colas, fruit juices, grease, latex paints, alcoholic beverages, mildew, catsup, wine, washable inks, most lipsticks, food and urine. Exceptions: dyes, indelible ink, stains set by heat. Non-toxic, non-flammable and biodegradable. Freeze and thaw stable. 1. Wet stained area with Mystical. Wait 1 or 2 minutes. 2. Lightly agitate with fingertips. 3. Blot with terry cloth towel. 1. Wet the desired area. 2. Let set for 15 minutes. 1. Wet gum area and let set for 30 minutes. Wet area again. 2. Take a coin (quarter) and work edges of gum to the center and remove gum. 1. Lightly mist using a sprayer and let set for 15 minutes. 2. Lightly mist once again and blot stain out using a terry cloth towel. 1. Mix 4 ounces to 1 gallon of water.